I spent Sunday afternoon visiting my folks in Gray Court. My parents had just visited my Aunt Ann, who turned 90 this month. Therefore, much of the discussion involved family history, and we even took an excursion to a cemetery in Laurens County to look up some family history. First is the picture above. My Aunt Grace had brought it by this past week and my mother had asked if I could scan it, clean it up a bit in Photoshop, and print some copies. I was able to enhance the image a litte and even get rid of some of the white specks that were on the image. I scanned the entire matte, then desaturated the actual photo using the RGB channel mixer so that I could try to bring out more details. The photo shows the family of John Lafayette and Elizabeth Dorn (Betty) Smith, my great-grandparents. My grandmother, Annie Elizabeth, is located on the second row, third from the left. My Great-Aunt Sarah, located on the front row, is holding a large doll. The doll’s white face and dress tend to blend in with Sarah’s dress, but the legs of the doll are visible. The effect is to make it look like Sarah has very short legs. If you look carefully, however, you will see Sarah’s black shoes and leggings below. The photo was taken on March 13, 1908, so it’s over 100 years old. It’s interesting to note the stern expressions on everyone’s faces. There are two theories here – one is that the process of having a portrait taken in those days was an unpleasant ordeal, requiring the subjects to maintain a rigid pose for a long exposure. The other is that a stern demeanor was indicative of seriousness and piety. I remember my grandmother laughing and telling jokes, but her public face was always one of seriousness with a hint of a twinkle. Later in the afternoon my dad took us down to the old Providence ARP Church Cemetery. This is located on a dirt road just off of the old road between Laurens and Clinton. We were looking for the gravesite of my great-great grandfather, Nathaniel Callaway Todd. The church is long-gone from this location, but there is a historical marker. The cemetery itself has fallen into neglect, with the chain-link fencing down in several locations and the headstones in bad repair. We found Callaway Todd’s grave in a corner of the cemetery. At least, we think we did. There was a gravestone for a Nathan C. Todd that was in the location Dad remember. However, it didn’t give birth or death dates. All it had was his service record from the Confederate States of America. There were many other Todds in the cemetery whose names I recognized from my genealogy databases. In particular was Samuel Aiken Todd, a great-great-great uncle born in Ireland. I also looked for Thomas Todd, father of Nathaniel C., but couldn’t find him in the short time we had to visit. Our route home took us through the heart of our family’s original land, including Rocky Springs Presbyterian Church, the farm I remember as a child, and several other historic family landmarks. I didn’t know anyone else knew where this cemetery was! Ron – I didn’t know where it was until my father showed me. I had been looking for it, but it’s certainly not where one would casually stumble over it. and did not find Thomas Todd. I have done research on Samuel Aiken Todd’s line and found out that his father was Nathan Todd, but don’t know where he was buried. I know someone descended from Thomas’ line who has done a book on this Todd family. 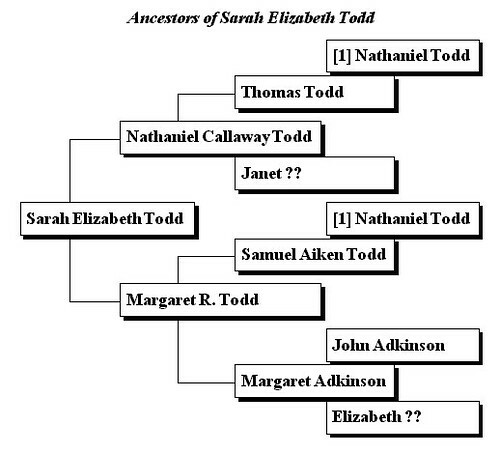 Would you be descended from Samantha Jane Todd, b. 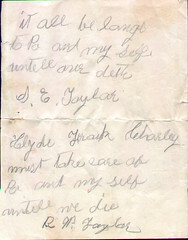 8 June 1856 and married Euel Thomas Taylor? I am descended from Euel Thomas Taylor. Jane – My great-grandfather, Robert Whitner Taylor, married Sarah Elizabeth Todd. 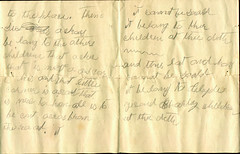 Tom, I found your Sarah Elizabeth Todd in David Todd’s book, but he had not traced the family further than that. Was she born about 1861 in Laurens Co.? Has someone in your family done the genealogy? I am the David Todd that wrote the book “Nathaniel Nathan Todd” that is in the Laurens Co., SC library. A lot has been learned about our Todd line since I wrote the book. Nathan’s eldest son, Andrew, moved from SC to the north in the 1830s and his bible stated where our Todds came from in Scotland before leaving for Ireland and after that America in 1793. We came from the Lock Lomond area of Scotland. A Mr. Richard McMurty, researching the line that produced Mary Todd Lincoln and administrator of the Todd DNA website, contacted me because my DNA test being one of the closest matches to Mary Todd Lincoln’s line, to ask if it would be okay for him to contact the Todds living today in Loch Lomond to do a DNA test to prove or disprove they are a close match to my DNA and the DNA of the line that produced Mary Todd Lincoln, with the end goal of determining the origins of Robert Todd, Mary Todd Lincoln’s earliest proven ancestor (and at same time would of course prove our Todds origins). Several Todds from Loch Lomond did the test for Mr. McMurty and the results were almost a perfect match with my DNA and the descendant of Robert Todd’s DNA, even after all the years of separation. Betty, I’d love to exchange notes. You should also check out Rocky Springs sometime. 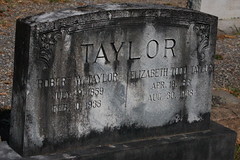 There is a monument with William Taylor’s name, and William Jr.’s headstone is right next to it. 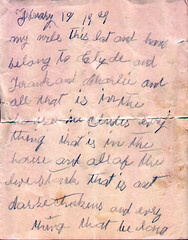 Hi I am related to a Todd, my grandma my dads mum her name was Sarah Elizabeth Todd. She married a William mcardle. Her sons are William and gordon mcardle. Sarah has passed away and so has William her husband and her son William. But gordon is still living. But I think my gran Sarah came from Lisburn to Glasgow.